(left to right) Wes Angel, MD, Richard Duszak, MD and Ivan DeQuesada, MD are former awardees of the ACR's J.T. Rutherford Fellowship from Emory Radiology. Three former awardees of the American College of Radiology’s prestigious J.T. Rutherford Fellowship in Government Relations currently serve in the Department of Radiology and Imaging Sciences at Emory University. Named in honor of the ACR’s first lobbyist, the Fellowship was founded in 1993 to provide radiology residents direct personal exposure to the government relations of organized medicine. The two-week fellowship in Washington, DC allows trainees to gain an understanding of state and federal legislative and regulatory processes and the roles that physicians and their professional organizations can play in influencing health care policy. Dr. Richard Duszak, Vice Chair for Health Policy and Practice, served as the first Rutherford Fellow in 1993 while a resident at Duke University. 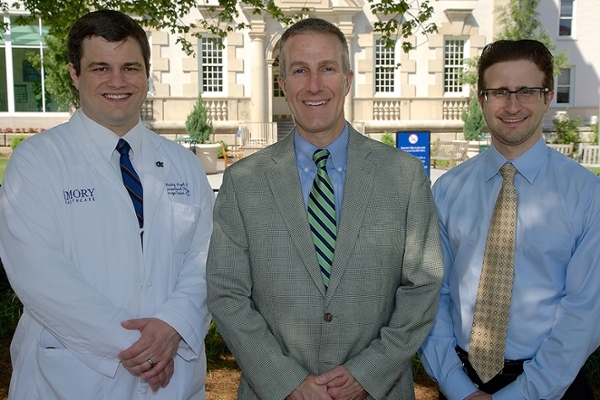 Dr. Wes Angel, Fellow in Vascular and Interventional Radiology, served recently as a Rutherford Fellow during his residency at the University of Tennessee. Current Emory University Diagnostic Radiology resident Dr. Ivan DeQuesada just recently completed his Fellowship. Like Dr. Duszak, many former Rutherford Fellows have risen to leadership positions within the ACR and other organizations. “The Rutherford Fellowship was a wonderful opportunity for me to learn about government relations and advocacy. The experience provides trainees with the tools to shape radiology’s role in the future. I would highly recommend this fellowship to anyone considering applying”, said Dr. Angel. “The experience in DC reinforced my positive impressions of the ACR's Government Relations activities. I witnessed the importance of advocacy first hand as we worked with lawmakers to improve health imaging policy in America”, added Dr. DeQuesada. The Rutherford Fellowship is just one of several highly competitive opportunities offered by the ACR to residents to pursue very specialized training. Dr. Margaret Fleming was selected this year to serve as the James T. Moorefield Fellow in Economics. Also offered are the E. Stephen Amis Fellowship in Quality and Safety and the Valerie P. Jackson Fellowship in Education.